"A large cloud obscured the traditions of hunting after the First World War, following the break-up of private lands which totally changed the life of the rich who were the former landowners. Their ability to posses a large pack of dogs for coursing, and organize grand parties and receptions, was then highly criticized. A new era began, totally new... The population did not yet become accustomed to all this change when the Second World War occurred. Poland and all that was Polish disappeared. The war... the tragedy. And the sighthounds?? The properties, and manor houses.... abandoned. the kennels.... empty. The old employees of the manors, the peasants also, well knew the value of the sighthounds. The possession of arms had become forbidden and the possibilities for the (common folk's) nourishment restrained, the peasants then start to make use of the wandering sighthounds. With this little bit of attention, the dogs did what they could best do, silently coursing from dawn to dusk.... they demonstrated to the peasants what they had only had hearsay of before. Very resistant to contusions and fatigue, ardent in the pursuit - like the falcons; they closed in silently on their prey. It is thanks to this that many sighthounds, before that wandering loose - had survived the war. However, after the war was over, their existence became more and more difficult. 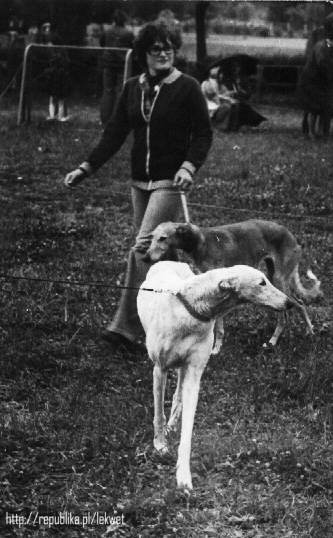 According to the communist ideals imposed in Poland after 1945, the sighthound, symbol of the rich proprietors of the land previously and of their exploitation, had to disappear. The representatives of the authorities and their operatives, the militias, hunters and veterinarians immersed themselves with passion to this task. They practiced this by killing all the dogs. This kind of purging, with a varying intensity, still occurs in our day. The former law before the Second World War obliged the owners of sighthounds living in the countryside to obtain an authorization for ownership. After the war, this law was changed, and following acts of hunting, a decision was made which ordered the capture of Charts, mainly in the old territories of the old land owners. In 1972 a passionate dogophile, Dr. Mroczowski, wrote an article about the subject of the Chart Polski; their history and the current reality of the breed, demonstrating that in certain regions that were once Polish territory (now USSR territory) there still were pure specimens of the breed in existence. He issued an appeal to safeguard the breed. The total disinterest and malevolence he encountered while trying to safeguard our very ancient, indigenous breed, slowed their registration efforts with the FCI. The people conscious of our cultural heritage were even more determined. Their profound conviction and their reasoning; supported by an illustrated documentation, the opinions of judges (specialists in sighthounds) and the benevolence of one of the greatest factions of the canine world led, on the 25th of January 1981 to the decision to open a new stud book for the Chart Polski. Thirty dogs were registered in this book: some the descendents of the old kennels, some imports from Podole (Ukraine), some puppies from new breedings; litters from the breeders Aga, Actum, Podniebne Szlaki, Celerrimus and others. The work of the breeders was very intense. In 1989, the standard was approved under FCI #333. At the time of their participation at numerous shows, the dogs were well received, won new admirers..... they are beautiful, and fast. This was confirmed on the coursing field. They constitute a living symbol of the Polish tradition and form a link between the past and the present." Malgorzata Szmurlo, later with the help of her sister, Izabella Szmurlo, were instrumental in this revival of the breed. They searched the Polish and Ukrainian countryside for specimens of the breed. They are the founders of Celerrimus kennel, the most important kennel in the contemporary history of the breed. "Today, one no longer questions the existence of the Polish Sighthound; all the academic discussions on this subject are fortunately closed. The Polish Kennel Club has confirmed the breed in 1981. Eight years later, in June 1989, it was recognized by the F.C.I. In sixteen years, significant progress has been realized with the Chart Polski. We have started with dogs possessing the pedigrees of only one generation. 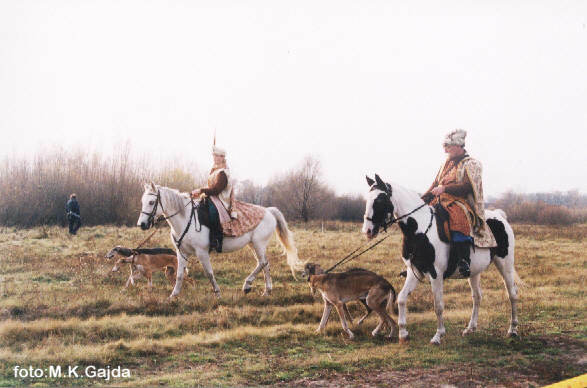 The origins started with only a small number of the breed, whereas today, the majority of the Chart Polski possess pedigrees with four generations. Only two females are registered with the Introductory stud book. One can observe also a clear improvement on the size of the Chart Polski. Previously, one could see subjects of a small size which hardly reached the standard size. Currently, the majority of the females are taller than 70 cm at the withers, and 80 cm or more for the males is no longer so exceptional. More and more, one can admire the typical, long, powerful but very noble heads. Fortunately, one no longer sees at shows the heads of the old type with a stop too accentuated, a skull with a frontal furrow; a light, fine, too soft ear. The majority of the Chart Polski have a magnificent coat, typical to the breed; although in a significant number of subjects the hair still lacks length. Globally, the breed is becoming more and more homogenous. .It has been brought to the attention of the judges and the handlers that the Chart Polski shouldn't be shown like a greyhound, with the hind legs drawn far apart and the head held very high. The Chart Polski, compared to the Greyhound, has a different rear angulation, much straighter; a croup more vertical, and the withers much lower. The Chart Polski presented like a Greyhound, in a forced position; is not well emphasized, and looks unnatural. Also the same - at a trot, the correct action of the rear legs of the Chart Polski, in no case should resemble the trot of a Greyhound or Whippet. The Chart Polski tracks in a line (not like the fox): it puts one rear foot in front of the other; in this manner their tracks form a single line. The genuine, contemporary Chart Polski is an animal of great size, with a large solid bone structure, with a rather dry musculature: in comparison to the Greyhound the Chart Polski is more veinous. His head is long and noble, slightly divergent - muzzle from topskull, with a roman nose. His coat is hard to the touch, thick in winter, with culottes on the thighs and well defined fringe on the tail. (brush) The coat will be thinner in summer. WORKING DOG OR SHOW DOG? One of the essential components of the Chart Polski is his great physical condition: he is above all a working dog; the mass of the dog must be of muscle and not of useless fat. It is wrong to speak of coursing dogs and show dogs as separate things. The Chart Polski must be an animal so well formed and trained that it can at any moment to take part in any event in the field." Other European countries, such as Belgium, Finland, France, Germany, Netherlands, Norway and Sweden also have a growing following of enthusiasts for the breed. Here in the USA the breed has a small, dedicated group of enthusiasts behind it.